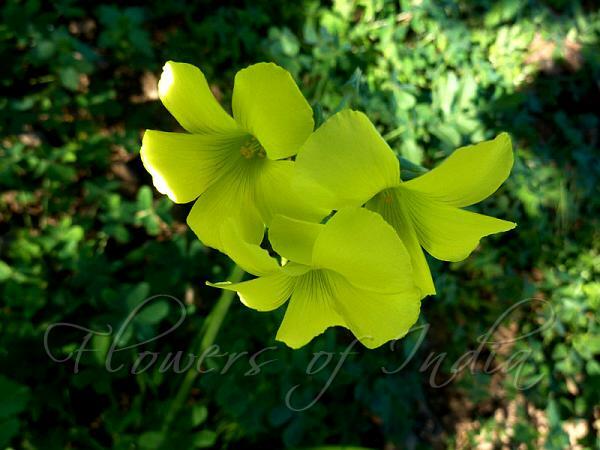 Bermuda buttercup is a low growing perennial broadleaf plant with shamrock-like leaves. A loose basal rosette of leaves up to about 14 inches (35 cm) tall grows from the bulb. It has fully subdivided (compound) leaves, each consisting of three heart-shaped leaflets that resemble clover leaves. Leaves are hairless to sparsely hairy, green, often with brown or purplish spots. Stems are located mostly below ground. It can be distinguished from creeping woodsorrel by its more upright growth, larger leaves and flowers, greater number of flowers, and lack of seed capsule. Flowers bloom from November through April. The flowers are bright yellow, 1.8-4 cm in diameter, and are borne on top of a leafless stalk rising 6 to 12 inches tall. There are less than 20 flowers per cluster. Each flower has 5 bright yellow petals. 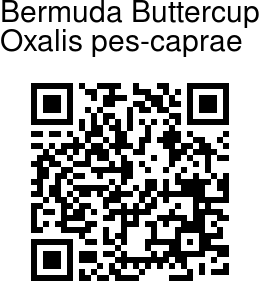 It is grown as an ornamental in India.